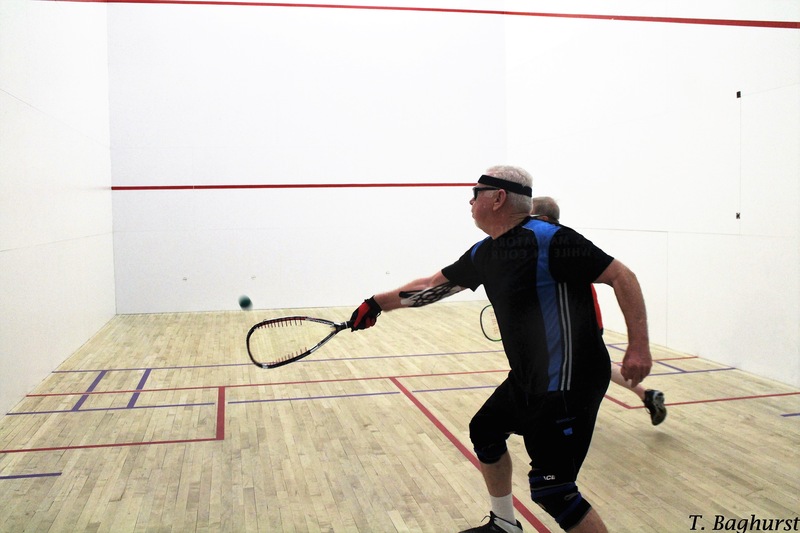 On August 30th almost 200 racquetball players from the ages of 35 to 90+ descended on Albuquerque, New Mexico, USA for the Senior World Championships. Perhaps descended isn’t the correct word, as the city sits at over 1,600m above sea level. Players represented 15 countries across North and South America, Africa, Europe, and Asia; USA, Mexico, and Bolivia brought the largest pool of athletes. For five days players battled across age divisions in singles, doubles, or mixed doubles, and a few brave souls entered all three divisions! The tournament is known for its hospitality and fair play, but perhaps it’s best recognised for its gruelling schedule. Most divisions comprise a round robin format which generally requires players to complete 6 or 7 matches, where each match is 3 games to 11. Points are earned for matches won, individual games won, and points won. Thus, winners and losers are often not determined to the very last match or even game, and those brave individuals who compete in 3 divisions may play as many as 60+ games in 5 days! There were many outstanding performances during the week but several deserve mention: Hector Urquidi Enriquez (MEX) in 35+, Victor Lopez (MEX) in 50+, and Stephen Wattz (USA) in 60+ all won their men’s singles divisions without losing a game. Perhaps the match of the tournament was between Richard Eisemann and Mike Grisz in the 55+ singles, where Eisemann claimed gold over Grisz by winning 11-10 in the third. Newcomer Veronica Nogales (BOL) was in fine form claiming the women’s 35+ singles title without a lost game. Longtime attendees Marie Gomar (GUA) and Cindy Tillbury (USA) also did the same in 50+ and 55+, respectively. European representation at the World Seniors was limited, but Timothy Baghurst (ENG) defended his 35+ men’s doubles title from 2015 with first-time partner Allan Hernandez (MEX). Grisz (USA) gained some parity on Eisemann (USA) by claiming gold in the 55+ doubles. Although a round robin format means anything can happen, Grisz won the gold medal in a hotly contested come-from-behind 10-11, 11-10, 11-8 win with his partner Mark Baron (USA). Americans Stephanie Bird and Tina Bragdon were the dominant women’s doubles team at the event. Special mention must go to Americans Lola Markus, Robert Castillo, William Matotan, Lake Westphal, and Ralph Waddington, who all competed in the 85+ or 90+ categories. Their participation serves as a reminder that racket sports in any form can indeed be lifelong.